Becoming a Farm Girl: Part Two | Bloom. Note: This is the second of a three part series to celebrate National Agriculture Day that will show my (non-traditional) journey to Agriculture. My hope with this story is to shed light on the many different faces of a “farmer” and how those who are not born into family farms can still learn, celebrate, find careers and purpose in this important industry. Just days after my eighteenth birthday, I headed to college at Purdue University. First football game! Showing off our student tickets with my roommate, Sarah. Sarah was so nice and was also a member of Purdue’s Triathlon team! I remember the huge sense of relief that came over me when I arrived at the orientation for sorority recruitment. Finally, girls that were friendly, passionate, motivated, and, not to mention, looked like they could be great shopping buddies. Finally girls that made me feel more like me. Throughout recruitment we were put in groups of about twenty girls and spent a lot of time in alphabetical order. I was sandwiched between a tall, beautiful girl named Amy and a tiny, peppy blonde named Kelsey. Kelsey’s dorm was one building over from mine. She was a cheerleader and Homecoming Queen in high school. Amy and I quickly made the connection that our mom’s were in the same Purdue sorority only a few years apart. Kelsey and Amy also found a lot of common ground. They were both from small towns in Indiana. Kelsey’s family had horses. Amy’s raised pigs. I listened as they talked about funny memories from the summer’s fairs where both of them participated in 4H competitions. We were learning to write resumes and the textbook shared a few samples. One of the samples listed 4H as an activity. Our poor teacher had to explain the organization to the class full of “yuppie” teenagers. I remember the sense of confusion and even giggles that day. Sewing, farm animals, and pageants? We all were certain this was the oldest textbook on the planet. 4H had to be something that was only around when our parents were kids. Please. No one does anything like that now. At the end of the week the three of us wound up in the same sorority. Bid Night 2005. New members were in blue. Kelsey is on the far left. Amy is in the center right. Yours truly has the big, blingy, white sunglasses on her head. My first year of college wore on and I continued to meet new people and to learn new things about myself, the world, and others. And it was in that first year, I learned that farming is far from backwards. Many of the students at Purdue had parents who raised animals, were farmers, or had careers somehow related to the agriculture industry. And, many of these students were following in their footsteps. In fact, one in ten students at Purdue were a part of the College of Agriculture. Before college, I was led to believe that agriculture and farming was “old fashioned” and that it was not viable career. But, the young people in the College of Agriculture knew that the industry was diverse, growing and innovative. These future agriculture leaders were studying at Purdue because the future of the industry demanded higher education. They knew that there were jobs in agriculture that would put the over thirty different majors within the College of Agriculture, including Agriculture Communications, Agribusiness Sales and Marketing, Food Science and Engineering, to use. The industry of producing, processing, and selling food actually makes up 15 percent of the American work force. However, it also wasn’t too out of the ordinary for the students to be preparing to take over their parent’s roles on the family farm. Of the over two million farms that cover the nation, 97% of them are family owned and operated. They knew that they were learning skills in the College of Agriculture that would help them feed not only America, but the world, as nearly a quarter of the raw US farm products are exported. These students were motivated and beyond intelligent. But, they didn’t carry these facts around with them every day. At school, they were just fellow Boilermakers. And at the time, I didn’t realize how much my selected course of study relied on the Ag Students. I chose to study Hospitality Management thanks to a passion for putting on events. (…Thanks, High School 5K!) However, the summer before my junior year I studied abroad in Switzerland and was bit by the culinary bug. Prepping an Apple Tart at a culinary class in a Swiss kitchen in 2007. This led me to Los Angeles for an internship the summer before my senior year. The internship was with a food service company that was contracted at a large corporation to handle the catering and cafeteria service. As a Midwestern girl, I was beyond stoked for a summer in LA. I packed my bags and headed west with visions of hanging with surfers, spotting stars everywhere and becoming Lauren Conrad’s next BFF on The Hills. I never in a million years would have imagined the group of people that I ended up spending a lot of time with in Southern California… Farmers. In addition to the day to day tasks in regards to catering events and running a large cafeteria, I was asked to help with a handful of projects. One particular project was to create an onsite, bi-weekly Farmers Market. The corporation valued work life balance and to support that my boss decided to bring the Farmer’s Market to work. The employees would have the opportunity to shop on their lunch hour versus giving up time at home with their families on the weekend. I worked through our produce supplier to connect with growers located close to LA County. As I met with them to learn about their produce, I was so surprised to see the many different faces of farmers. Some were young, some old. Some men, some women. There were many different backgrounds, from Hispanic to Australian to American through and through. But, they all had one common thread: They were so proud of the food they produced. And, they couldn’t wait to share it! My conversations with these farmers left me energized and eager to do their products justice as I tried to sell them at the pseudo Farmer’s Market. But, I didn’t have to try too hard. It was 2008 and SoCal was on the forefront of the organic, local, green, Farm to Fork movement. The farm fresh produce sold itself. The market was a huge success. We sold out of everything each week. I loved seeing the corporation’s employees so thrilled to have healthy options to take home to their children instead of swinging by In-and-Out after work. I was also intrigued with how interested some of the people were in learning about the people who grew their food. And also, how they grew the food. They weren’t afraid to ask questions. 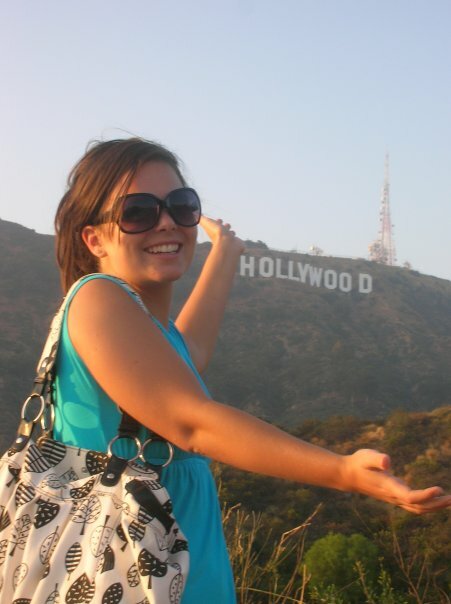 Lovin’ Life in SoCal in 2008! That August I left LA to begin my final year at Purdue, convinced I would be back the following June to start my career. But a couple months later, my plans began to change when a boy, named Adam, asked me to his fraternity’s dance. … His Agriculture fraternity’s dance. Pingback: Becoming a Farm Girl: Part Three | Bloom.